Rock ‘n’ Roll Raleigh Marathon & ½ Marathon presented by WRAL with featured charity The V Foundation unveiled a new 5K course today, which will take place at Dorothea Dix Park on Saturday, April 9 at 8:00 a.m. 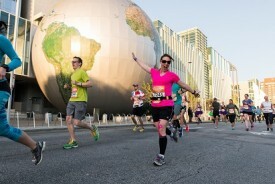 This is the first year Rock ‘n’ Roll Raleigh is offering two days of running with the marathon and half marathon on Sunday, April 10 at 7:00 a.m. In true Rock ‘n’ Roll fashion live entertainment will be stationed along the 5K course and at the finish live festival. Participants that run Saturday and the marathon or half marathon on Sunday will complete the Remix Challenge. These runners will earn three medals including, the coveted Remix Challenge medal in addition to each race’s finisher medal. The marathon and half marathon start downtown and will take runners on a scenic tour of Raleigh through the charming homes of Oakwood, North Carolina State University and other attractions. Participants will be greeted by the sounds of live entertainment, along with spectators and cheerleading teams lining the route to motivate runners to the finish line. Upon finishing downtown, participants are invited to relax and celebrate with family and friends at the post race Toyota Rock ‘n’ Roll Concert Series. This year Rock ‘n’ Roll Raleigh has expanded its entertainment lineup with Weekend of Music, which will feature music Friday, Saturday and Sunday as well as an endless array of on course entertainment. Multi-Platinum artist Gavin DeGraw will kick off the weekend with a Friday night concert at Red Hat Amphitheater.